Present state: The station site is occupied by the rear service area of Roys supermarket. Notes: The original Sudbury Station was opened on 2 July 1849 as the terminus of the Colchester, Stour Valley, Sudbury & Halstead Railway's branch from Marks Tey. The station had a single platform with a two-storey brick building on the west side, with a hipped slate roof. This building also incorporated the stationmaster's house. There was also a small brick building with a hipped slate roof on the platform. There was a large water tank on a brick base at the south end of the platform; this fed a water column alongside the track 50yd south of the station. There was a run-round loop opposite the platform from which a short line ran into a single-road engine shed. The shed was of brick construction and had an unusually shallow pitched roof. The Great Eastern Hotel at the junction of Station Road and Great Eastern Road opened in 1849 shortly after the station. 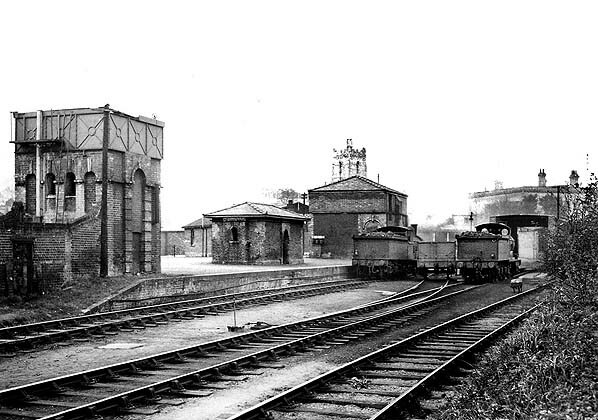 When the line was extended to Cambridge, a new through station was opened on a new alignment to the south,and the original single platform terminus was incorporated into the town goods yard. 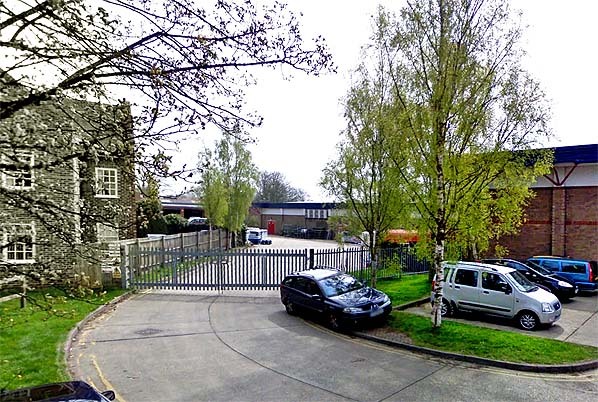 The original station building was retained and adapted as a goods warehouse. 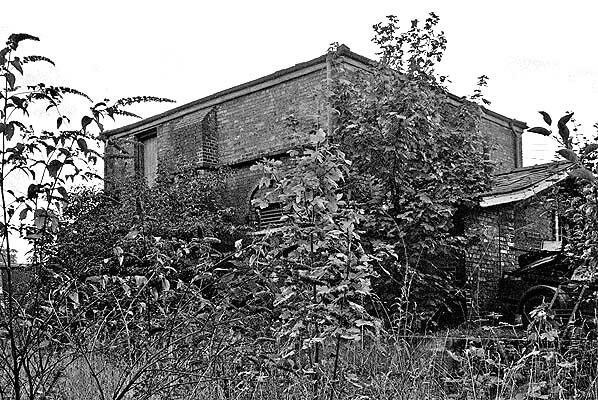 The shed was demolished in July 1956 but the shed road and water tank remained in use until October 1959. Sudbury had an extensive goods yard. In 1884 there were six sidings to the west of the old station, one of these passing through a substantial brick goods shed. Five of these sidings ran on across Great Western Road to serve various maltings. The malting industry was established in Sudbury largely after the arrival of the railway. A malthouse, or maltings, is a building where cereal grain is converted into malt by soaking it in water, allowing it to sprout and then drying it to stop further growth. The malt is used in brewing beer, whisky and in certain foods. In 1904 private sidings served RA Allen and Sons, Great Cornards, Oliver Brothers Brewery and Wheeler & Sons. 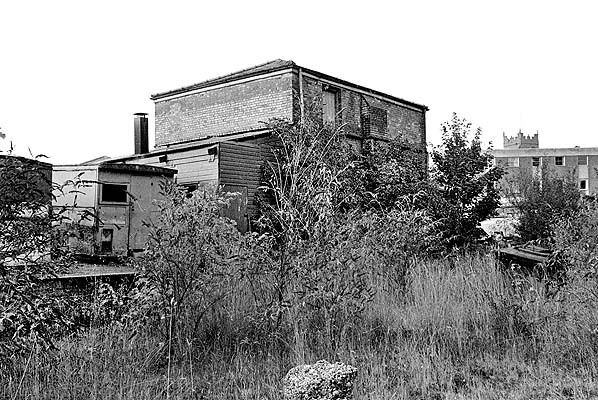 An additional siding ran south at right angles to the other sidings to serve another malthouse. It was linked to all the other sidings with a wagon turntable. In 1904 the yard had a small 1 ton 10 cwt capacity crane. Access to the yard was controlled by the Sudbury Goods signal box sited on the down side of the Cambridge line close to the junction. Another siding to the west of the original station served a cattle dock and pens, with an entrance for livestock on Cornard Road. Another siding on this side of the yard served Oliver's Brewery and the Chilton brickworks. There was also a horse dock; this was not in the goods yard but was reached from the Cambridge line immediately east of the down platform of the second station. 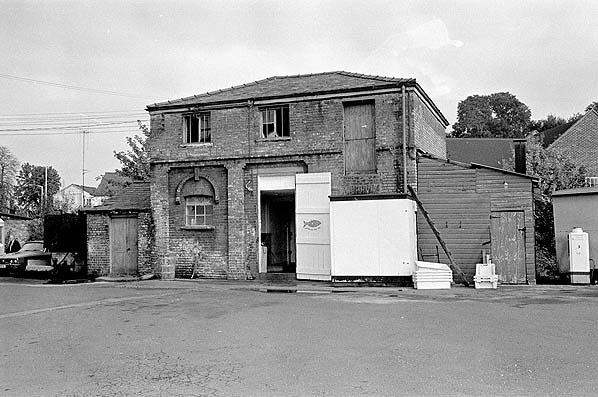 In 1991 this dock was rebuilt becoming the third Sudbury station. By the 1950s Sudbury's brewing industry was still operating, and the network of private sidings serving the maltings was largely unaltered with private sidings serving Allen & Boggis, E Baker Ltd, Edme Ltd, T Moy Ltd, Shell Mex & B.P Ltd and Wheelers Ltd. The yard crane had also increased to 5 ton capacity. Sudbury goods yard closed on 31 October 1966 and the site has now been redeveloped with a Solar (part of Co-op) supermarket (now Roys supermarket) and car park occupying most of the site; this was built in the late c1985. Track was still embedded in Great Eastern Road until 1986; and the last evidence of the railway, a weighbridge on the west side of Great Eastern Road, alongside one of the former malthouses, was removed in May 2011. This has gone to the East Anglia Railway Museum and Chappel. In 1846 the Colchester, Stour Valley, Sudbury & Halstead Railway was authorised by parliament to build a 12 mile line between Marks Tey and Sudbury. On 1 June 1847 further Acts were obtained allowing the company to extend from Sudbury to Clare with a branch from Melford to Bury St. Edmunds. The company was leased to the Ipswich & Bury St. Edmunds Railway which was in turn absorbed by the Eastern Union Railway the following month. The line from Marks Tey to Sudbury opened on 2 July 1849 and on 1 January 1854, the Eastern Counties Railway (ECR) took over the Eastern Union Railway. In July 1860, the newly formed Sudbury & Clare Railway Company revived the 1847 Act and by a new Act of July 1860 they were empowered to build a line from Sudbury to Clare via Melford. However, as soon as the powers were obtained, the ECR took over and immediately sought extended powers to build from Sudbury to Shelford on the London-Cambridge main line, plus a branch from Melford to Bury St. Edmunds. At the same time, the Colne Valley Company, anxious to be independent from the ECR, sought approval for a line to Cambridge. The Act renewed the authorisation for the proposed ECR lines to proceed with the addition of a connecting line at Haverhill between the Stour Valley and Colne Valley railways. The first section between Shelford and Haverhill opened on 1 June 1865. The remaining lines from Haverhill to Sudbury followed on 9 August.1865. During the period prior to the First World War, the line saw some of its best traffic with through trains between Cambridge and Clacton via Sudbury. The war brought little reduction in traffic but by the 1920s the familiar pattern of road competition was setting in, although rail traffic continued quite healthily for some years; some economies were made but many excursion trains continued to run. After the war excursion trains returned once again to Clacton and other seaside resorts. Changes came when British Rail announced a modernisation programme. From 1 January 1959, steam was scrapped and replaced with diesel railbuses and multiple Units. Although passenger traffic showed some improvement, it was not enough to overcome the increasing losses being incurred. Closure of the entire line to passengers from Marks Tey to Shelford (Cambridge) was proposed in the Reshaping of British Railways (‘Beeching’) report of March 1963. On 23 April 1965, the British Railways Board gave notice of their intention to close the line from Marks Tey to Cambridge with total closure planned for 31 December 1966. On 19 September 1966 Barbara Castle, the Minister of Transport, agreed to closure from Sudbury to Shelford; however she refused permission to close the Sudbury to Marks Tey section because of commuter needs and planned development at Sudbury, and in the Network for Development map of early 1967 this branch would be shown as part of the basic network to be retained. 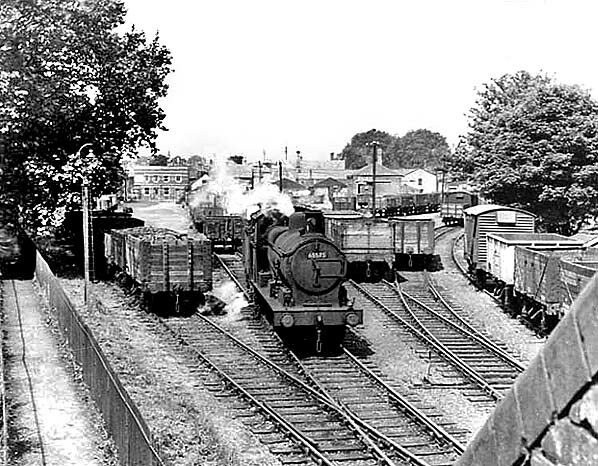 The freight service was withdrawn from all the stations on the Stour Valley line during the 1960s; the last station to lose its freight service was Haverhill on 31 October 1966. Closure of the Sudbury - Cambridge passenger service was delayed while local councils considered providing an annual subsidy; this was eventually refused because of the high cost. The line from Sudbury to Shelford closed entirely on 6 March 1967. In November 1969 the contract for the removal of the permanent way was awarded to A. King and Sons of Norwich, and the track was lifted the following year. The line to Sudbury survived several further attempts to close it and, after the 1974 energy crisis and the threat of petrol rationing, it was reprieved in the interests of the local community. For more pictures of the Stour Valley Railway see David Underwoods 'The Reshaping of the Stour Valley Line' web site. Tickets from Michael Stewart (except 4772 Roy Lambeth). Route map drawn by Alan Young. Click here to see a high resolution version of the 1884 OS 1:500 Town Plan showing both Sudbury stations and maltings sidings. An undated view of the single-platform terminus at Sudbury. The two-storey building was the stationmaster’s house with the booking office on the lower floor. The single-storey building on the platform is assumed to be contemporary with the station. The water tank at the end of the platform is also an original structure. The engine shed is seen on the right. This map shows the proposed station at Sudbury. The station buildings show are somewhat different in shape to those that were built. The shed was originally planned to be two- road. The plan shows 22 lots of land to be sold by the Stour Valley Railway. No.1 plot (top left) became the Great Eastern Hotel. The roads around the plots are all labelled 'proposed new road'. The road at the top became Station Road with Great Eastern Road running from top to bottom. Two tramways are seen in two of the new roads. 1884 1:500 OS Town Plan shows the original Sudbury station now incorporated into the goods station, The station building and platforms are clearly shown. There appears to be another long building on the platform. 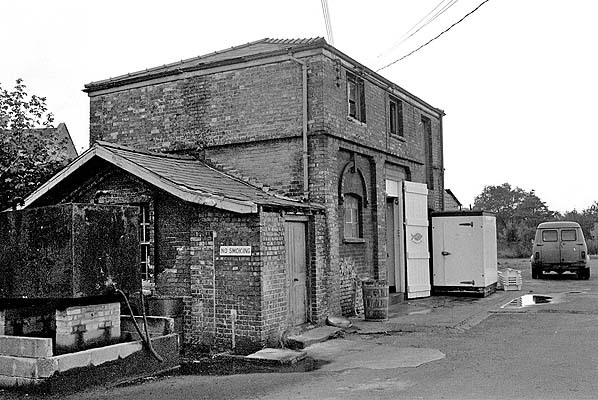 This is not visible in any later photographs, The engine shed is seen opposite the main station building with a siding to the west of the shed serving a cattle dock and pens, with an entrance from Cornard Road. The water tank at the south end of the platform fed a water column shown near the bottom of the map. On the bottom right corner a siding serves Oliver's Brewery which opened in 1874. 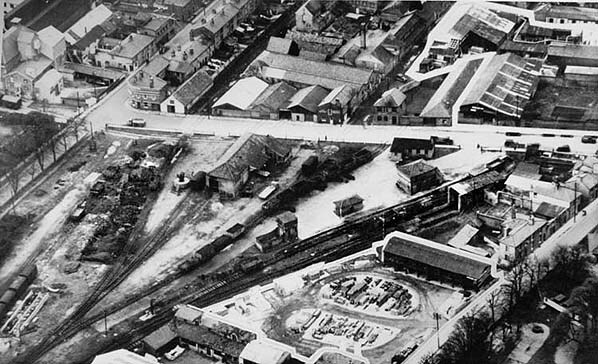 The goods shed is seen in the left corner of the map as are five sidings crossing Great Eastern Road to serve maltings. Note the four wagon turntables giving access to a further maltings siding running south. The main station building of the first Sudbury station in 1949. The building, which once incorporated the stationmaster's house and booking office, has been converted into a goods warehouse. is out of view to the right. is seen on the left. Great Eastern Street is seen running diagonally access the bottom right corner with the first station building and engine shed seen bottom right. Two sidings are seen running across Great Eastern Street serving maltings and other industrial premises. 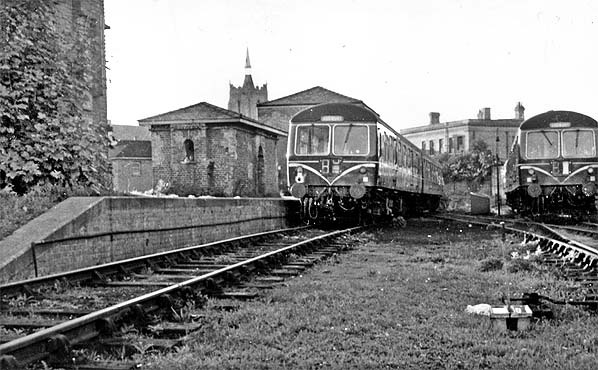 During the early 1960s the goods yard handled little traffic and some of the sidings were used for stabling carriages. Two Cravens class 105 DMUs are seen her, one in the first station platform, the other in the shed road. By this time the shed had been demolished. 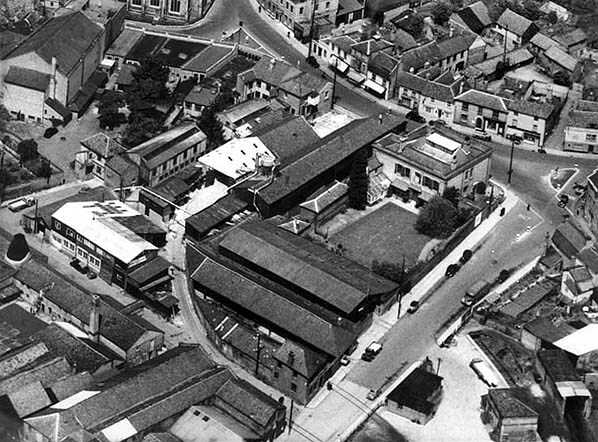 Sudbury goods yard closed in 1966 and by February 1974 all the sidings had been lifted and the buildings put to other uses. This view of the first station from the trackbed shows the platform and main station building. Another trackside view of the first Sudbury station in February 1974. The overgrown platform can be made out bottom right. wholesale fish merchant based in Lowestoft. 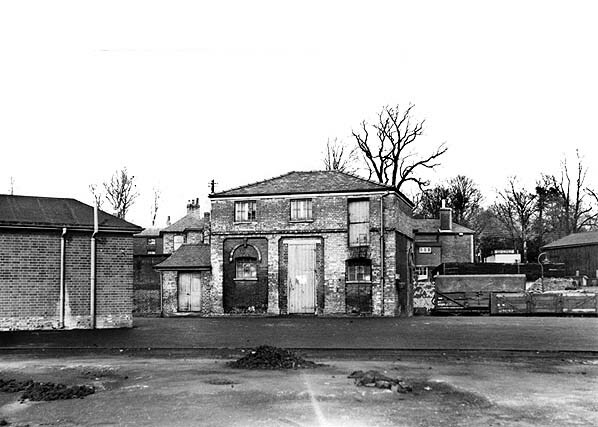 Sudbury first station building in February 1974. The site of Sudbury first station is now occupied by the service area of Roys supermarket.